2013 Wellington Round the Bays 1:33:54 (February 2013) – current PB! Taupo is a great destination for running events with the lakefront course being pretty flat. Having done the Taupo Half Marathon in 2012 I wanted to come back and have a go at this race again. The goal for this race was twofold. One was to run at around 4:30min per km, second to run under 1:35 which of course depended on the first goal. I wasn’t necessarily going for a PB on this race having just come off a Marathon in June I was just getting back into my second phase of training. Most my work has been on building mileage as I eluded to in my previous post. We left Wellington after work on Friday and arrived in Taupo pretty late Friday evening. After a sleep in Saturday was spent just chilling out in Taupo with a brunch at L’arte cafe in Acacia Bay – highly recommend it if you end up in Taupo. Then we walked around the Saturday market in Taupo. By the way if you are a girl and want some awesome running gear check out Kori Kita – http://www.korikita.co.nz/ NZ made by Kate and she’s at the Taupo market every Saturday. After nosing around the market went to the registration and race pack collection at the Great Lake centre. This was the 20th Anniversary of the Mizuno (main sponsor) Half Marathon. The race pack included some goodies as well as a running shirt by Mizuno. One of the other cool things was the Race number included an electronic chip already embedded so there was no plastic chip thingy you had to tie down on your shoe. This was pretty convenient and it’s becoming more popular in races I am told. Anyways rest of Saturday was spent just chilling out and went to bed early. Sunday was forecast for rain but the morning arrived with no sign of rain and or wind. I got to the race start by about 8:30am for the 9:00am start. I got around to the start with a race announcer going through the usual speech of thanking sponsors etc and also recognizing runners and walkers who have run all 20 events since 1994 when the race first began. The race started right on time (actually 8:59 according to my Garmin). I was in the first wave and got into a bit of a fast start for the first Km and joined a bunch of runners who seem to be content with running around 4:25-4:30 pace and got into an easy rhythm. I wasn’t pushing for pace so got into a chat with a gent who was doing his 20th race! Judging by the cheers he got along the way it was apparent he was a bit of a local runner celebrity and it was good to run along with him for a while. Around the 8km mark is a slight rise (not a hill) and a few people were slowing down who’d gone out a bit fast. Around here I caught up to another celebrity runner, Victoria Taylor. She’s run the length of New Zealand to raise awareness for Child Cancer NZ. It was nice to meet her in person and whilst she was also running! So I chatted with her for a bit and kept on with my original pace plan of sticking to 4:30min per Km. At the halfway point was a drinks station so I slowed a bit and had two cups of water and half a Gu gel and then got back into my rhythm. From this point on the course follows the edge of the lake along a paved path. I was still within my time of being on target for 1:35. The last few Kms hurt a bit and ended up finishing in 1:34 with average of 4.28min per km, which was pretty bang on what I wanted to pace myself for this race. After the race everyone got a shiny big 20th Anniversary finishers medal and a chocolate fish! 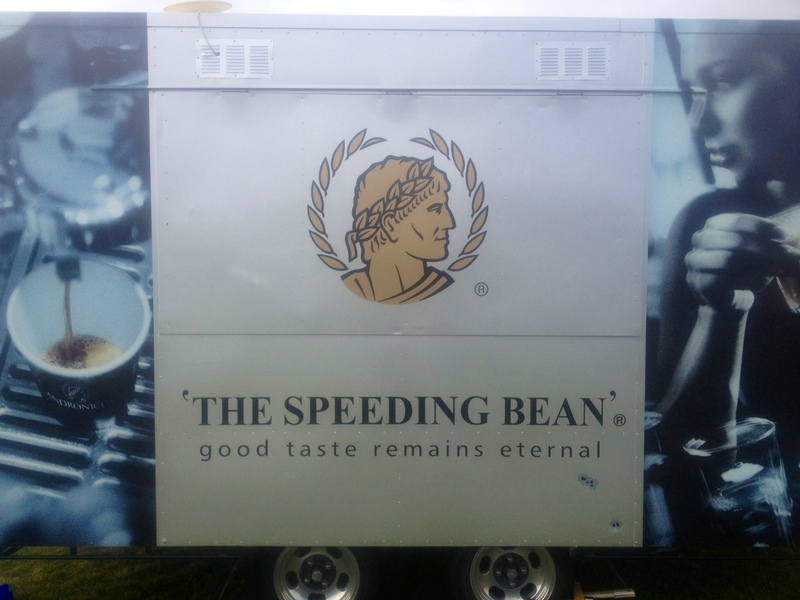 I went straight to the coffee cart – maybe I should have had “Speeding Beans” coffee before the race! Now I am back into my regular training schedule leading up to the 40km Abel Tasman Trail race in September 28th!